Fox Company is proud to show our partnership with the 120th Station Hospital. This Unit was formed by friends, spouses and significant others whose passion for WWII equals ours. This Unit is open to both Women and Men to portray a full Medical Hospital. This Unit will also work closely with Fox Company's medics and troopers for after battle triage simulations. The 120th Station Hospital Crew is under the direction of Diane Erickson and you are interested in joining up please click the below button to be taken to another page to submit your information. At Left the ETO Communications Zone Sleeve Patch. This patch would be the correct patch for the 120th that you would wear on your wools, Class A or Class B Uniforms. HBTs - top and bottoms, or coveralls. Though nurses were initially issued the jacket and pants, the coveralls were also acceptable. Headgear with the HBT and you should opt for the khaki headscarf but a Daisy Mae is also acceptable. Leggings - wwiiimpressions.com sells the female leggings, which were shorter than the male leggings. Last time I looked they were $45. Not required of course, but good for a completed look. ​Boots - female boots if you can, male boots will work in a pinch. sofmilitary.co.uk sells an awesome reproduction. Wools - female wool blouse and trousers. If you have to wear male wools, again, totally acceptable. These would have been worn with boots (unbloused) or shoes. 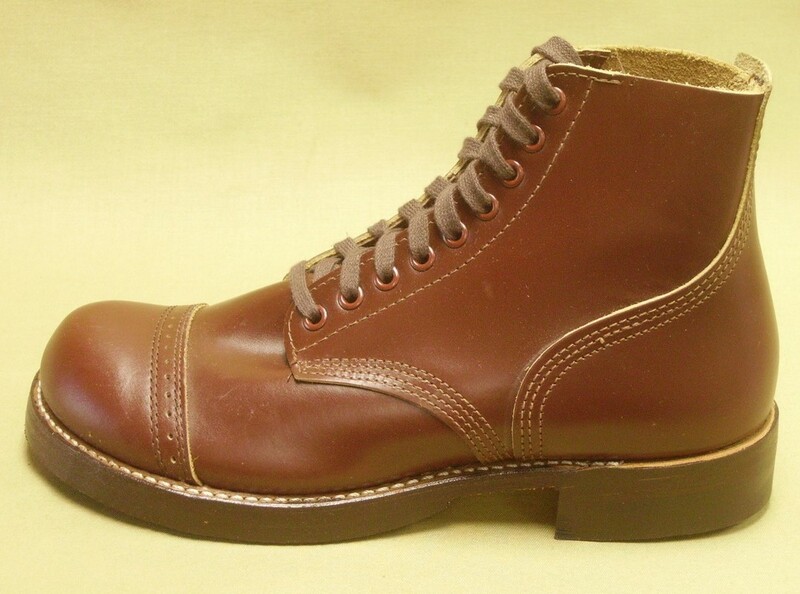 Shoes - the brown low-quarter shoe is also sold at Soldier of Fortune. Later in the war, nurses also wore loafers and saddle shoes - they wore whatever they could get their hands on! 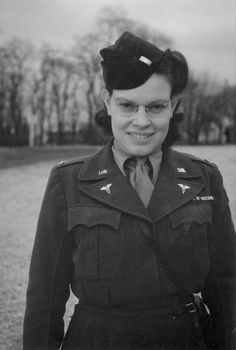 The Army Nurse Corp (ANC) Dress Uniform would be worn with all awards and feature correct US and Medical pins on the lapels. A Women's Garrison cap or visor would be worn on your head. A lighter weight, more casual version of the ANC Dress Uniform was the ANC Off Duty Dress. On the right is the ANC Summer Off Duty Dress. Both would be worn with matching visor or garrison cap. The Civilian dress might be the easiest of the Off Duty options as finding a great set of Dress Uniforms or Off Duty Dress in your size might be challenging or pricey. Use your creativity and find one, make one or combine vintage hats, dresses and purses for a great impression. For the Men's category we have split the differences between Enlisted and Officers and seen below. -Start with a set of HBT fatigues and a jeep cap or daisy mae. Please wear the garrison (service) shoes with no Unit Insignia. 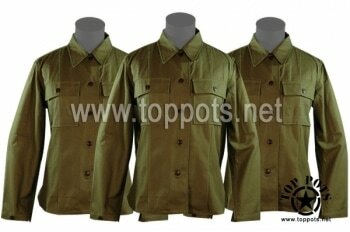 -Wool shirt, wool trousers, wool overseas cap with medical piping or no piping, garrison (service) shoes and leggings. garrison cap with incorrect infantry braid. ​The 120th has decided that if you are portraying an officer, you should be wearing a Class B uniform. This would be a set of Officer's Wools or Chocolate uniform or a mix of both the Chocolate shirt with wool pants or wool shirts with Chocolate pants. Appropriate rank insignia on the shirt collar and the look is complete with a khaki tie. 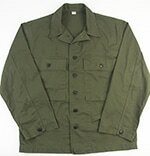 The M41 jacket or tanker jacket is common added to the Class B look. Shown on the left is the Officer Wool shirt with khaki tie, Wool pants, officer belt and visor. On the right a M41 Jacket has been added and also the officer overseas cap is worn with rank insignia..
Below is the Officer Chocolate Shirt, Trousers and Officer "Pink" Trousers and can be mixed with wools for the Class B look. The service shoe is also a good compliment to the Class B. ​As for class A's, you can wear a pink or chocolate shirt and pink or chocolate trousers. No wools. No ike jackets unless the event is themed for 1945. Also your insignia is worn on the jacket instead of the shirt. Please post any questions or comments. Shown is the 4 pocket Class A with the Pink Officer Shirt and Trousers. The look is completed with the Officer Quarter shoes pictured above. Where CAn buy these amazing uniforms? Below are a few of the places you might find items for your impression. Ebay, Craigslist, Etsy, antique stores, making one yourself or a reenactor board may be a better option. Blitzkriegbaby http://www.blitzkriegbaby.de/reenact/uniform.html where do I find uniforms.